If we ask senior managers at power and water utilities about the critical factors in managing their assets, they might refer to balancing business risk with financial constraints while maintaining mandatory statutory compliance. They might list things such as asset management strategy, plant capability, plant reliability, plant performance, spares inventory, adequate OPEX budget, real-time data and effective software platforms. Prompted further, leading utilities are making the link between delivering key functions and developing their people. Utilities are starting to see the need to invest in the development of their people as well as their systems and processes to help ensure implementation of sound business strategy. They may go as far as including people resources on their asset management breakdown structure. Power and water utilities the world over, whether public or private, are entrusted with managing important infrastructure providing a range of essential services to their customers. The effective operation of these utilities is a concern for governments, shareholders and communities alike, and utilities are increasingly focusing on being customer-centric, commercially focused, and operationally efficient. 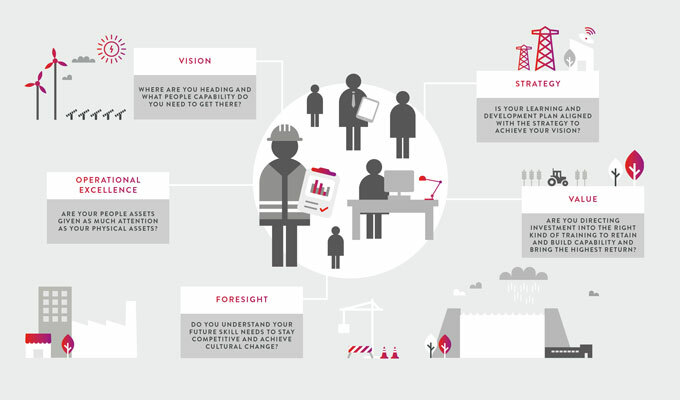 Many openly specify a vision or mission that requires the business to embark on a ‘change journey’, using words such as responsiveness, innovation, reliability, modernisation, optimisation, safety, communication, sustainability, operational excellence, commercialisation and continuous improvement. There is a commonality in many of these words, and that is people. It takes people to be responsive and commercially focused, to behave safely and to communicate. It also takes people to understand current performance and identify innovations. Effective and efficient delivery and operation rely on people having the right skills and the competency to bring about change. The change may include new technologies and systems that people will need to learn to apply. So, cultural change is at the heart of any such journey, taking into consideration the desired future state, the behaviours (as well as the skills required to get there), and effective engagement and empowerment of employees along the way. Over the years, I have worked with various power and water utilities, as well as developers and financiers, to lift capability across technical and managerial levels. I notice that, while people and their capability is on the minds of senior managers, there can be a disconnect with strategic direction, with no real integration with operational performance or workforce planning, and often a skewed view on what lift in capability is really required. Around the world, a more integrated approach to utility operations is emerging. 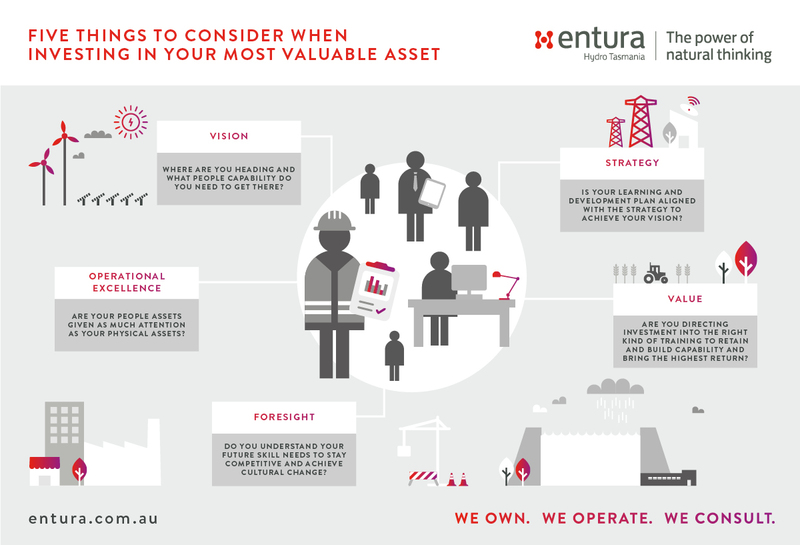 Globally, organisations are working toward change through integrated ‘asset management’ approaches that combine consideration of physical, people and process assets. For many utilities, the natural assets are also important as an input that must be managed sustainably (e.g. water resource) or managed to meet regulatory and customer expectations. Other frameworks help organisations to link human, financial, social and manufactured capital when implementing strategy. Whatever the framework, the integration of all ‘assets’ or ‘capital’ is important in achieving the somewhat elusive ‘operational excellence’. We know that fundamental to the success of a transformation journey is a sustainable workforce aligned to achieving the vision, mission and strategy of the business through the development of appropriate knowledge, skills and behaviours that focus on the business’s longer term goals. Thus, a whole-of-business approach to learning and development can play a critical role in successful implementation of strategy. Integration is needed across the various typical functional areas: strategy, finance, operations, human resource management and so on. Clients often ask the Entura clean energy and water institute to assist them with particular training in one of our key technical topics. Through further conversation, I often find there are other aspects in the holistic picture that need to be painted first. Are the procedures in place around which to train? Will this capability be important in the future? Will the learning and development activity address key risks? Who else in the business needs to understand these issues? Does it align with the strategic direction? Integrating learning and development into business planning and operations is one way to ensure that capability development programs are designed in the context of strategy and initiatives, workforce planning, operational plans, HR systems, functional structures and mechanisms, and risk management activities. Through facilitated workshops, senior management teams can set the broad direction for learning and development. This direction can then feed into more detailed capability assessments and training needs analyses. Through such an approach, investment in training is effectively apportioned in the right direction with the greatest chance of ultimately improving organisational success. Taking the time and effort to prioritise capability development and ensuring it is aligned with strategic direction will bring ultimate rewards for utilities and bring a real return on investment. Not only will investment in capability development be better directed, it will assist with the wider challenge of engaging employees in the change journey itself. If people grow fatigued with change, learning can rejuvenate and inspire. As Leonardo da Vinci once said, ‘Learning is the only thing the mind never exhausts, never fears and never regrets’. If you would like to discuss how to integrate learning and development objectives with business strategy or to design a training program to suit your organisation, contact Dr Amanda Ashworth on +61 417 503 692. Dr Amanda Ashworth is the Business Manager for the Entura clean energy and water institute. She is responsible for strategic development and operations including partnerships, client engagement, course development and oversight. Amanda also provides strategic advice on learning and development frameworks and contributes to leadership and management training for clients. Combined with her passion and commitment for capability development and training, Amanda’s research background and more than 20 years’ experience in environment, clean energy and water consulting and strategic planning, enables her to support clients to understand their capability and identify the right program of activity to meet their needs and bring organisational success.